The medal will be presented to early career scientists who will normally have completed their PhD’s within 15 years of the closing date for nominations. 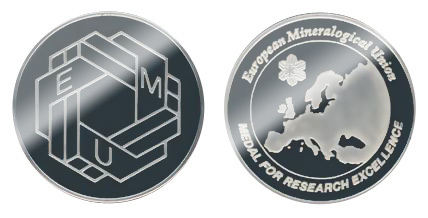 The EMU Medal Committee calls upon the member societies and all European mineralogists for nominations. The award ceremony is held before the medal talk given during an international meeting of relevance to Mineralogical Sciences selected according to the winner’s expertise. EMU will provide partial support for the travel expenses. The call for nominations for the 2019 recipient will be announced in fall 2018. Please contact Max Wilke if you should have questions. For the nomination, return the filled out cover page and the necessary documents to Max Wilke.